Decoupage artist and entrepreneur John Derian’s Cape Cod bathroom isn’t flashy or complicated. It’s charming and despite having a decidedly “back to basics” approach, John found a way to incorporate his signature sense of whimsy into the design. Here are four ideas you can steal to create a similar look in your space. Salvage yards and auction sites are really great for picking up sanitary ware in classic designs. You may need to have them resurfaced, and they’ll also require a serious disinfecting, but it’s worth it for the beautiful shape. 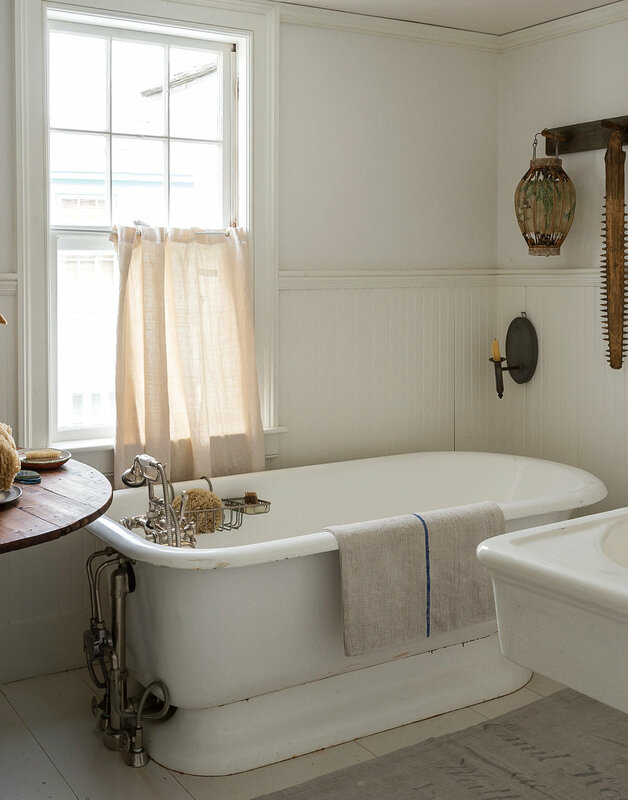 If you’re not keen on the idea of a reused tub, consider using vintage taps on a new tub. Not everything in this world makes sense, you know. The assortment of stuff John has hanging in his bathroom proves this (I’m sure I could’ve probably thought of a better example of the mysteries of the world, but we’ll go with this for now!). Bathrooms are traditionally kept purely practical and often lack character as a result. My advice? Keep your necessities in hidden storage and display a curated selection of pretty pieces. Speaking of necessities, don’t feel like your shampoo bottles and toothbrush holders can’t be beautiful. Realistically, most of what you have in your home serves a purpose and can’t be forgotton. This means your house can easily become overtaken by plastic, unattractive pieces. Where possible, use cute receptacles for storage. Think vintage ceramic marmalade jars as toothbrush holders, amber pump bottles for shampoo and teacups for Q-tips. Don’t be afraid to use pieces of stand-alone antique furniture in your bathroom along with built-ins. An occasional chair, end table or even just a wooden towel rack will break up what’s probably otherwise a tile and porcelain combo. Photography by Matthew Williams for Remodelista.